I just completed an order of 1,000 5x7 postcards through Overnightprints.com. We should have them in time for Dallas Comic Con. I'll distribute the remaining cards to various DFW comic book stores and other strategic retail locations. The hope is to spread the word about our work in D Magazine and Quick. Postcards designed by Paul Milligan. 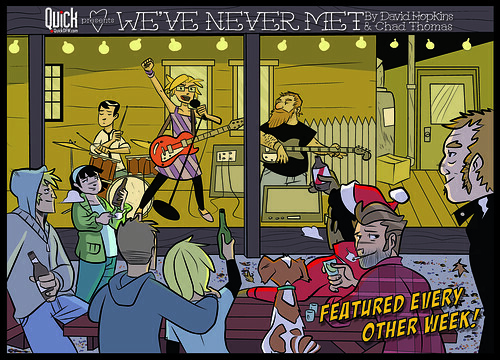 WE'VE NEVER MET art by Chad Thomas. SOUVENIR OF DALLAS art by Paul Milligan (again).